Launched in May 2014, the Art Discovery Group Catalogue (ADGC) offers an art-focused research experience within the OCLC WorldCat environment. Researchers may search within this specialized subset of Worldcat data to hone in on a vast trove of art-historical literature held in an ever-increasing number of the world’s finest art libraries. These art library records are searchable alongside additional content from a multitude of sources in the large metadata pool derived from thousands of commercial and freely-accessible collections, portals and repositories provided by OCLC as the WorldCat Central Index. Thanks to the development of the Art Discovery Group Catalogue, bibliographic records from a number of art libraries previously not in OCLC are now openly discoverable in the ADGC as well as in the general Worldcat, offering information about more of the world’s art-related publications to researchers while providing greater visibility for the art libraries worldwide. In addition, unique and important art-historical citation resources such as kubikat are now integrated within the ADGC, with others to follow, including the legacy files of the Bibliography of the History of Art (BHA). Future plans for this growing art-historical research tool are to identify and prioritize–with the engagement of the ADGC community–other art-related databases, journals, etc. requiring group subscriptions in order to be discoverable in the ADGC. Work on refining and enhancing the user experience within the ADGC is another high priority for the committee that will informed by the community. Another priority is to work with OCLC on the potential integration of more materials outside of traditional bibliographic boundaries, such as archives, images, and born-digital material. 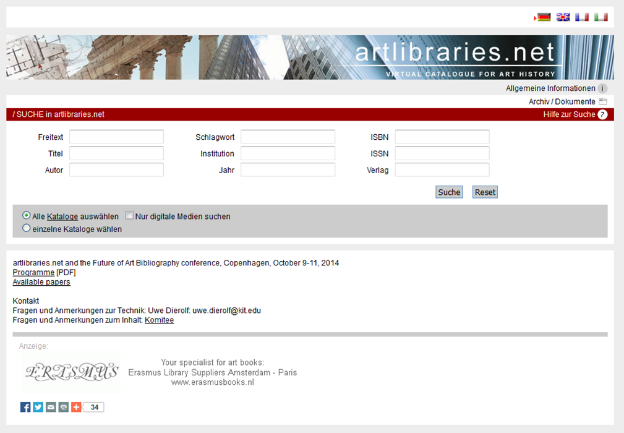 The idea to connect online catalogues of selected art libraries and to create a virtual bibliographic tool for searching discipline-specific information goes back to the late 1990s. 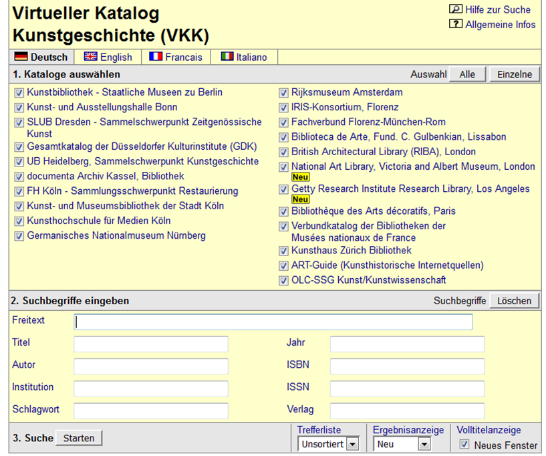 Based on the federated search architecture and the CGI-script protocol of the well-established Karlsruher Virtueller Katalog, the first version of the Virtual Catalogue of Art History, launched in 1999, unified the catalogue entries of the art historical holdings of two German university libraries and the young kubikat-consortium. At that time, it was the most efficient and economical way to integrate a substantial number of physically distributed bibliographic records in one search process and to create discipline-specific access to the related literature. By 2003, the first international partners, such as the Florentine IRIS consortium, the Union catalogue of the libraries of French national museums, the Rijksmuseum in Amsterdam, the Getty Research Institute in Los Angeles and others, came into play. The new network and its virtual catalogue were called artlibraries.net. In the years that followed, not only did the number of partners grow considerably to more than 90 libraries in 15 countries on four continents, but the meta search engine also included targets like Google Books and the Hathi Trust. artlibraries.net was thus an example of a machine-supported aggregation of bibliographic data derived from locally dispersed heterogeneous sources. The goal of this accumulation was to virtually create a comprehensive aggregator of bibliographic data for distinct bibliographic searches. In 2012, there were around 12 million records in the virtual data pool, referring not only to books but also to hundreds of thousands of journal articles, reviews, auction catalogues, and special collections. the final product of the described vision needed to be based on realistic, reliable and long-term financial and operational outcomes. Inspired by the adamnet group catalogue, a successful cooperation between a group of libraries in Amsterdam and OCLC, conversations with OCLC representatives started in 2012. Step-by-step, a scenario for transferring the bibliographic data of artlibraries.net partners to the WorldCat and unifying them with the already existing data pool as well as with additional sources was developed. 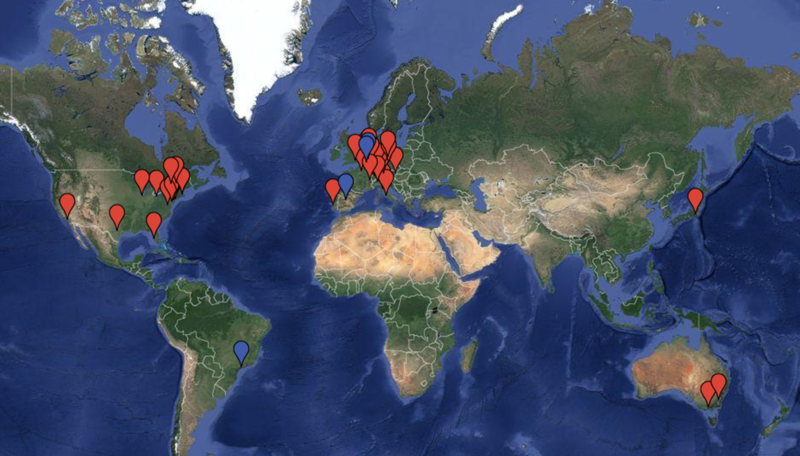 A call for participation in this new, experimental initiative was followed by 30 art libraries. 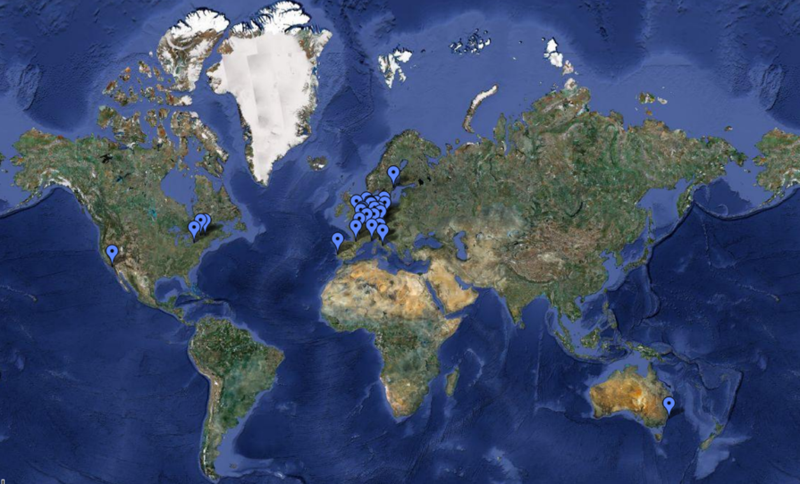 Since that date, more than 60 art libraries worldwide have become members of the Art Discovery Group Catalogue. Apart from the continuous integration of new participating library catalogues, the next steps in developing the Art Discovery Group Catalogue will be the identification and inclusion of additional sources such as special databases and image collections. An encouraging example is the recently connected Scipio database, a gateway to more than 300,000 auction and sales catalogues from the sixteenth century to the present. The metadata of this important, license-based source are now searchable in the Art Discovery environment. The integration of other discipline relevant sources such as portals to digitized books (e.g. the Getty Research Portal) or bibliographies is on the agenda for the near future. 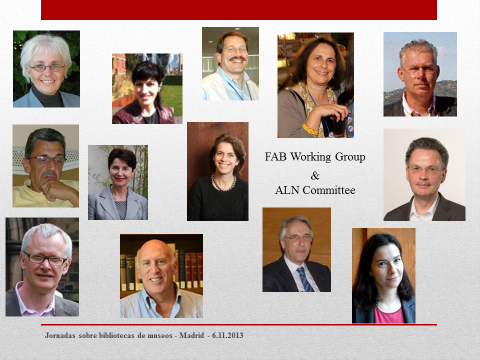 Suggestions for new partners and new sources to be integrated are welcome. If you are responsible for an art library wherever in the world and your holdings are catalogued following international standards in terms of cataloguing rules and data structure then send us a description of the collection profile. A request for becoming partner in the Art Discovery Group Catalogue can be made at any time in informal way, by contacting the project manager or one of the committee members. Participating in the group catalogue is with costs, referring to a one-time fee for loading your data to WorldCat (if this is not already the case) and to an annual maintenance share. In both cases, the amount depends on the size of your library.